For many parents, the everyday evening routine of winding down and trying to get their child to fall asleep can be a challenge. Young children, especially toddlers, tend to have difficulties sleeping at night. Along with nightmares, nighttime fears, and their ability to get out of bed at night, toddlers experience a drive for independence that can make bedtime difficult. As they try to assert independence, their imaginations can get in the way of sleeping (e.g., the monster under the bed). And their increase in motor, cognitive, and social skills can also prevent them from having a good night’s sleep. But adequate sleep is essential for your child’s development and overall well-being. It’s also important for you as a parent so that you can have some time to yourself. And getting your child to bed early will give you more time for yourself in the evenings to get things done. Sleep directly impacts cognitive and physical development. During sleep, we alternate between two different stages of sleep—the quiet deep stage of Non-Rapid Eye Movement (NREM) and the active stage of Rapid Eye Movement (REM). During deep NREM sleep, there is an increased blood supply to our muscles, tissue grows and repairs itself, our energy is restored, and hormones are released for growth and development. And during REM sleep, our brains are active and dreaming, while our bodies become immobile. Promotes growth—the growth hormone is mostly secreted during deep NREM sleep. 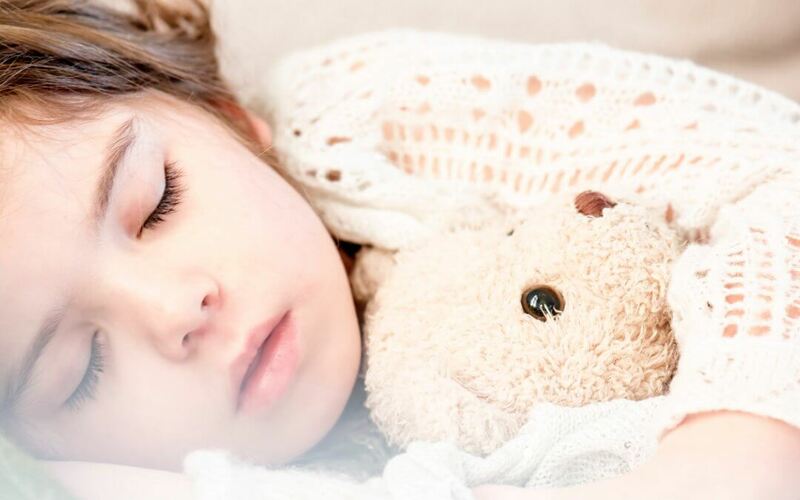 Improves heart health—kids who sleep well have a reduced amount of stress hormones and glucose circulating in their bodies than those who have trouble sleeping. Sleep disorders are linked to higher levels of heart disease, obesity, and diabetes. Affects weight—too little sleep can cause kids to become overweight. Sleep deprivation can reduce the production of the hormone leptin, which notifies us when our hunger is satisfied. This reduction in leptin can lead to kids overeating. And tired kids are also more likely to be sedentary, burning fewer calories than kids who are well rested. Boosts the immune system. During sleep, the body produces proteins called cytokines that fight illness, infection, and stress. So the less kids sleep, the weaker their immune systems can be, and the more likely they’ll develop colds and other illnesses. Reduces the risk of injury—tired kids are more likely to be clumsy and impulsive, leading to a higher risk of injury. Boosts the attention span—children who consistently sleep fewer than 10 hours per night before the age of three are more likely to be distracted, impulsive, and hyperactive, displaying the same symptoms as ADHD. Helps with learning—children who nap are more likely to retain the knowledge they’ve learned. Toddlers (ages one to two years old) need around 11 to 14 hours of sleep in 24 hours. Once toddlers reach 18 months, they will usually only need one nap per day that will last one to three hours. Your child is overtired, sleepy, or cranky during the day. Does your child get enough physical activity at daycare? And does your child get a nap at daycare? It’s important to keep children active and healthy during the day through indoor and outdoor activities at a quality daycare or preschool program so that children can burn energy and rest properly at night. Throughout the day, diet and exercise, along with naps, can all affect how well your child will sleep at night. So avoid starchy, sugary, and caffeinated foods, and make sure your toddler has a nap that is no longer than three hours in the early afternoon. Follow a consistent daytime sleep schedule. Make sure your child participates in outdoor and indoor activities for kids each day. Don’t make nap time too close to bedtime—early afternoon is ideal. Don’t feed your child big meals close to bedtime. And avoid giving your child caffeine (e.g., pop or chocolate) less than six hours before bedtime. If your child needs a bedtime snack so they don’t get hungry in the night, make sure it’s healthy, such as a cracker or a small piece of fruit. Avoid stimulating activities after dinner. Warn your child when bedtime is in five minutes, or give them a choice between going to bed now or in five minutes. Follow a consistent and relaxing bedtime routine that is 20 to 30 minutes, and no longer than 40 minutes. Bedtime should be before 9:00 pm—make sure they get at least 10 hours of sleep. Keep the bedroom environment consistent each night and throughout the night—e.g., cool, quiet, with the same amount of light, and without a TV or other electronics. Blankets should allow freedom of movement and the bedroom temperature shouldn’t be too cold or too warm. Don’t sing or rock your child to sleep—they will become dependent on this and need it to fall back to sleep in the middle of the night. Instead, give them a comforting object to fall asleep with. Be consistent and clear with your limits and provide a security object, such as a favourite stuffed animal or blanket. If your child calls for you after you leave the room, wait a few minutes to respond. This pause will remind your child that it’s time to sleep. And while your child is waiting for you, they can self-soothe and fall back to sleep. If your child leaves their bedroom, walk them back to bed and gently but firmly remind them that it’s bedtime. To help with your child’s nighttime fears, give them an object, such as a flashlight or a big stuffed animal to protect them. Use a reward system for going to bed on time and staying in bed all night, e.g., a star sticker for each successful night, with three stars leading to a prize. The light from device screens tricks our bodies into thinking it’s daytime and lowers the levels of melatonin—the hormone that signals our bodies to fall asleep. So to prevent a decrease in melatonin that can keep your child up at night, avoid screens before bed, and consider making a rule of no screen time after dinner. A bath and reading to your child before bed will help relax them so they can fall asleep easier. Avoid scary stories and TV shows before bed. Instead, stick with your child’s favourite books. If your child always asks for one last thing before bed, such as a glass of water, a snack, a trip to the bathroom, or another book, include this in your bedtime routine to get ahead of these requests and keep the routine you’ve built intact. A quality daycare and preschool will ensure your child will eat well, take naps at reasonable times, and engage in activities throughout the day to also help your child sleep better at night. Kids Kingdom in Kanata promotes indoor play and physical activity for kids with a massive indoor playground. And the daycare and preschool programs support children’s cognitive, emotional and physical needs so kids can learn, grow, and be confident and healthy.